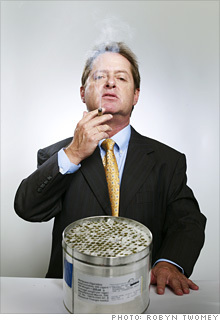 Irv Rosenfeld is one of four U.S. citizens who get their medical marijuana from the federal government. 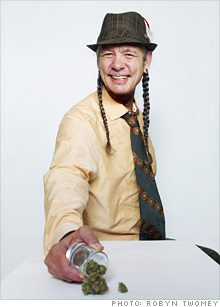 Stephen DeAngelo founded Harborside to show that a marijuana dispensary could make a positive contribution to a community. This is, after all, the norm vis-�-vis medicines. Once a pharmaceutical has been FDA-approved for one use, doctors can lawfully prescribe it for other, so-called off-label purposes, even though the drug has not yet been certified as safe or effective for them. His clinic, across from a scenic stretch of Oakland harbor, is identified only by its address -- a large, block-letter "1840" painted on the fa�ade of an inconspicuous, gray-blue one-story building on Embarcadero Drive. Pioneering canna-businessman Richard Lee, also in Oakland, has opened his Blue Sky Caf� dispensary as a coffee shop, taking his cue from Amsterdam. Lee acknowledges that he runs the Blue Sky as a for-profit business, a situation that the City of Oakland authorities have at least tacitly endorsed, notwithstanding SB 420's apparent prohibition of "for profit" distribution.